Eleanor was born in New York, New York on October 11, 1884. She was shy and wanted a lot of love. Her mother passed away when she was 8 years old, so she lived with her grandmother. Eleanor was happy when her father visited. Her father died when she was 9. After her father’s death she became very sad. She started going to school at Allenswood School in England. Eleanor grew into a great woman while she was at this school. While she was there, she was not as sad as before. Eleanor saw Franklin on a train and started to talk to him. She and Franklin were 5th cousins. They became engaged in 1903. Franklin and Eleanor got married on March 17, 1905. Eleanor helped Franklin during his career. She worked with the Red Cross and the Navy Department. Eleanor started to become weak in 1962 and died on November 10, 1962. Eleanor stated that the country should not expect the new First Lady to be a symbol of elegance, rather “plain ordinary Mrs. Roosevelt". Eleanor became the First Lady of the United States of America to hold a press conference on March 6, 1933. At some of her press conferences she only allowed women to attend. Mrs. Roosevelt believed all people should be treated fairly. She worked hard to help needy children, coal miners, and African Americans. Eleanor didn’t believe in separation because of skin color. Mrs. Roosevelt was one of the Daughters of the American Revolution. Eleanor joined League of Women Voters. Her goal was to help women make political gains. Eleanor formed an organization for world peace. She hired a committee to work for human rights. Eleanor and her group worked on the Declaration of Human Rights. 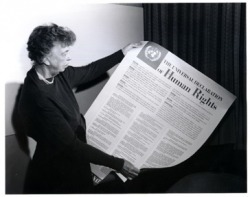 Eleanor presented the Universal Declaration to the United Nations. Eleanor showed compassion and interest in human rights by all the work she did in writing the Universal Declaration of Human Rights. With all of Eleanor’s problems, she could have failed. When Eleanor was 7 her dad had to go to an insane asylum. Eleanor’s dad had problems with drugs and alcohol. Eleanor’s mother died when Eleanor was 8. A year later her father passed away. Eleanor did not feel loved when she was a child. Eleanor’s mother called her “Granny” because of the way that she looked. She wanted to be loved. When Eleanor became the First Lady she did not think she was qualified for the job. She had to face many opponents. Eleanor fought her self-doubt. She was very, very shy. Eleanor was uncomfortable in social gatherings. During gatherings, Eleanor would giggle a lot because she was nervous. She never was able to just “small talk” with someone. She did not feel like she was a great mother. Eleanor relied on maids to help her. -Eleanor went alone to the Inauguration Ball. -She served scrambled eggs for the White House lunch. -Eleanor set the table with unmatched china.